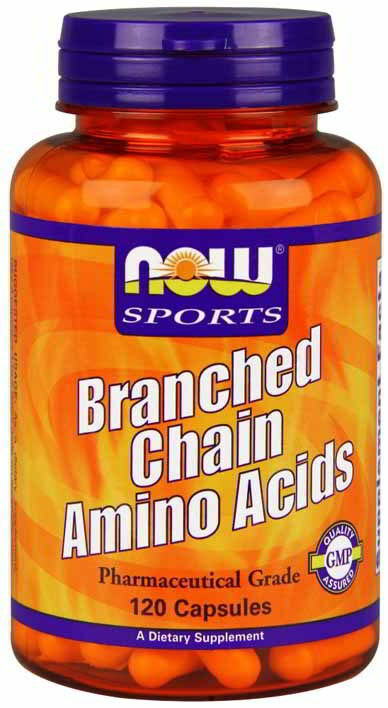 NOW Branched Chain Amino Acids (BCAA's) are 3 essential amino acids which are abundant in muscles. The branched chain amino acids Leucine, Isoleucine and Valine are three of the eight essential amino acids that the human body must receive in food. These amino acids cannot be synthesized in the liver. As a dietary supplement, take 4 capsules 1 to 2 times daily, on an empty stomach especially before and after exercise. * Percent Daily Values (DV) are based on a 2000 calorie diet. Other Ingredients:Gelatin (capsule) and Stearic Acid (vegetable source). Contains milk derivative. Contains no: salt, starch, yeast, wheat, gluten, soy, egg, shellfish or preservatives. Contains milk derivative.